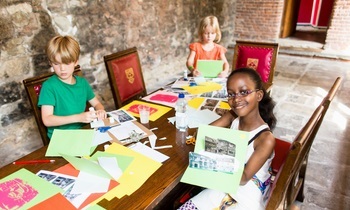 Visit the Charterhouse for a creative day out with the family. 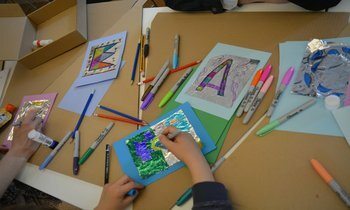 Free activities are available every day and special workshops run during school holidays. We’ve come up with our ‘Top 5 Tips’ for a great family visit to the Charterhouse. From tricky trails to Talbot tours, enjoy a host of fun-filled activities. Help us find Thomas Sutton’s escaped Talbot greyhounds. Discover medieval monks, regal royals, terrible Tudors and naughty schoolboys along the way. Can you help us find all six? Visit our What’s On page to find out when our next Family Tour is taking place. 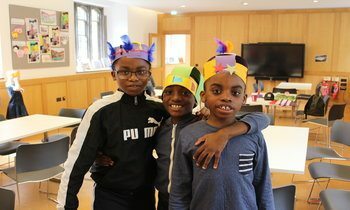 Every holiday the Charterhouse comes alive with themed activities and workshops to make the school break extra special. Every holiday takes a different theme linked to our fascinating history and heritage. Visit our What’s On page to find out about our next holiday workshops. 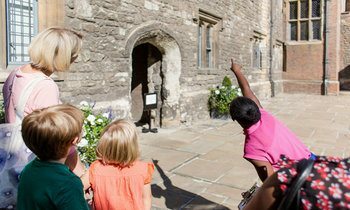 Collect our free family trail and let Thomas the Talbot guide you around the Charterhouse. Uncover hidden stories, naughty school boys and precious objects. Pick up your free trail from the front desk. Drop in and get crafty in our learning centre. 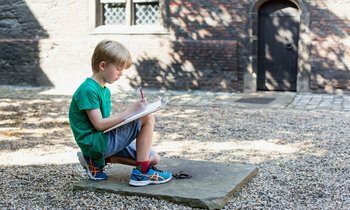 Make a royal mask and join the court of Elizabeth I, create Tudor finger puppets inspired by King Henry VIII or add a splash of creative colour to our inspiring architecture. Free and available every day. Everyone looks at things differently. Walk around the museum having a look at all the different objects. Pick your favourite and least favourite objects. Why have you chosen them? Discuss your choices and reasons with your group, their reasons might surprise you! Choose one of the previous groups of residents at the Charterhouse. It would be a monk, Tudor, schoolboy or Brother. Act out your character and let the rest of your group guess who you are. Join our teachers network to receive advance booking of our school visits and in-school sessions, as well as a host of other opportunities and benefits.